Wait, you may be asking, what’a wug? The short answer is that a wug’s not a thing. Literally. It was chosen as a good, possible English word that didn’t have a meaning associated with it. The long answer is that a wug’s one of the ways that we know phonology is real. 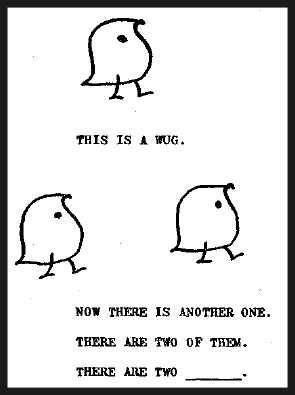 These are wugs, from Jean Berko Gleason's work on child morphemic acquisition "The acquisition and dissolution of the English inflectional system", published in 1978. Sorry, nothing really funny to say about them. They are pretty cute, though. In English, there are two ways to make a word plural. You can add -z to the end, and you can add -s to the end. They’re actually very similar sounds, but with a slight difference. When you’re making a -s sound, you don’t vibrate your vocal folds, so there’s no sort of louder buzzing noise (linguists call that voicing), but when you make a -z sound, you do voice it. When that happens is determined by the sound in front of the plural marking. If it’s voiced, the voicing is sort of smeared over into the -s on the end, mainly because it’s easier to say. Now, this is a rule that you know and can apply without even thinking about it. But children have to learn it somehow, and we didn’t really know when this happened developmentally. Which is what the wug test was designed to find out. If children have learned the rule, then they’ll say “wug-z” instead of “wug-s”. It turns out that four- and five-year-olds have usually got this rule down cold. Which tells us something useful about how we acquire language. And, you know, watching four-year-olds trying to stay on task is adorable. ‹ PreviousYour ears are lying to you. Are emoji sequences as informative as text? Should English be the official language of the United States? What's the best way to block the sound of a voice? Where 👏 do 👏 the 👏 claps 👏 go 👏 when 👏 you 👏 write 👏 like 👏 this 👏?